Each of the Final 6 castaways fight for safety during the Individual Immunity Challenge. 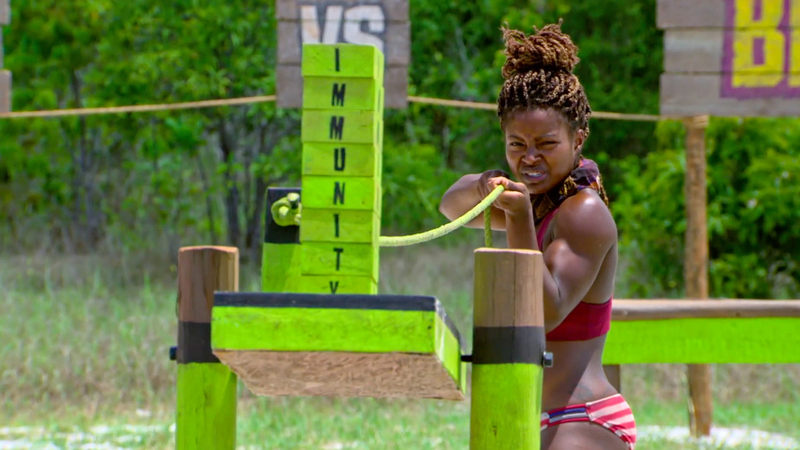 To win the Individual Immunity Challenge, each of the Final 6 had to spell out the word "immunity" one block at a time, all while balancing said blocks on a table using one long rope. And when everyone’s blocks began wobbling and falling to the ground, it became increasingly clear that the challenge was really anyone's to win. In the end, Cydney was the biggest standout with a strong lead and Joe struggled the most by consistently misspelling the safe word. At one point, it looked like Jason might lap Cydney, but when the female body builder placed her eighth and final block on the table, she carefully backed up to the mat and proudly took the win.